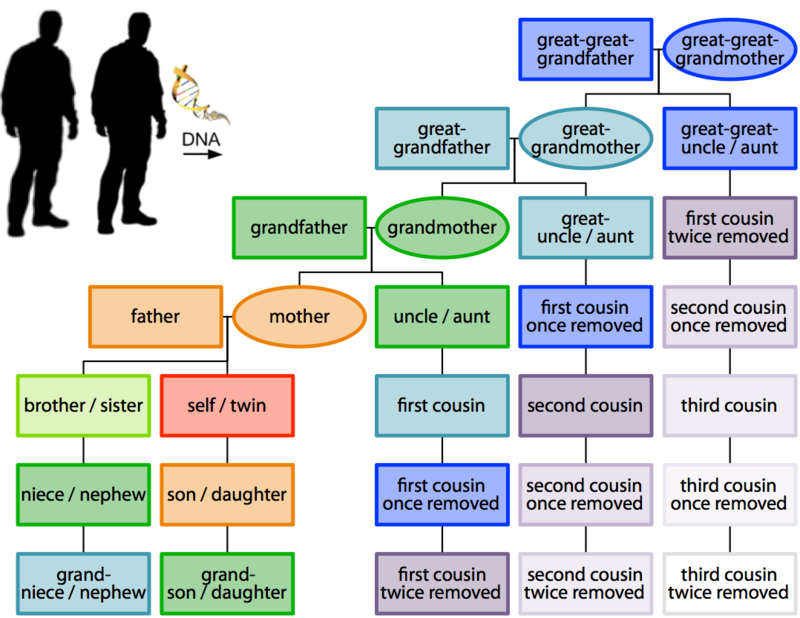 Parabon Snapshot can provide inferences about the familial relationship between the sources of two or more DNA samples. Using the power of genome-wide SNP data, it is possible to precisely calculate the degree of relatedness between two people, even if the relationship is very distant. Whereas traditional STR-based kinship analysis is limited to distinguishing parent/offspring relationships, Snapshot’s kinship model uses hundreds of thousands of SNPs to identify up to 6th-degree relationships while preventing false positives (unrelated pairs mistakenly inferred to be related). Snapshot Kinship Accuracy, measured as the frequency of correct predictions of the exact degree of relatedness (absolute accuracy) and the frequency of predictions within one degree of relatedness (n = 1,282 relationships). All relationships are defined relative to the black square. Parabon’s scientists were not satisfied with the kinship solutions developed by academics and chose to develop a new algorithm that takes advantage of the massive amount of data made available by genome-wide SNP typing to compare two genomes and determine the precise degree of relatedness between the two individuals. Traditional kinship analysis uses fewer than 20 short tandem repeat (STR) loci, which lack the resolution to establish relatedness beyond parent-offspring or full siblings, and is easily confounded by mutation or mistaken testing of a close relative of the true parent1. More advanced analyses use pieces of DNA that are directly transmitted through the maternal (mitochondrial DNA) or paternal (Y-chromosome) lines; however, these approaches are limited to a small subset of relationships and are very low resolution. For example, ~7% of unrelated Europeans share the same mitochondrial haplotype. MtDNA and Y-STRs can only suggest that two individuals may be related but cannot say what the degree of relatedness is. Parabon’s kinship algorithm analyzes the similarity between two genomes and uses a machine learning model to predict the degree of relatedness of the two individuals. In more than 1,000 out-of-sample predictions, this method has proven to be highly accurate while maintaining a very low false-positive rate (i.e., unrelated pairs are almost never mistakenly inferred to be related). 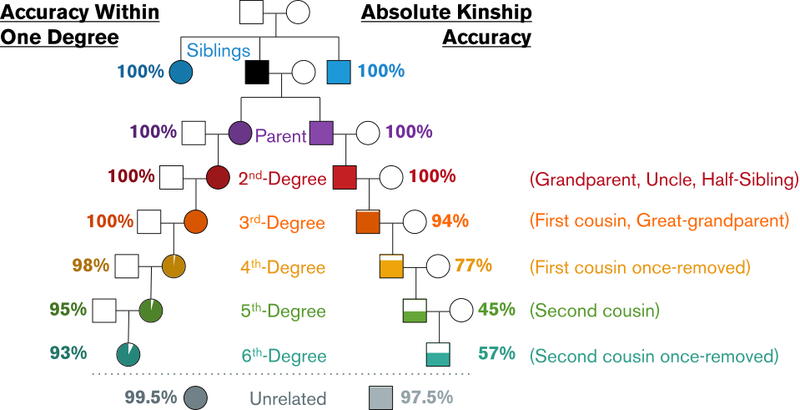 Accuracy is 100% for parent-offspring, full siblings, and 2nd-degree relatives — i.e., grandparents, aunts and uncles, and half-siblings — and Snapshot can distinguish 6th-degree relatives (e.g., second cousins once removed) from unrelated pairs with greater than 97% accuracy. Using genomic data from large populations of subjects with known phenotypes, Parabon’s bioinformaticists have built statistical models for forensic traits, which can be used to predict the physical appearance of unknown individuals. The Snapshot kinship capability can be used to establish familial relationships between a DNA sample and previously collected DNA samples or among a set of new samples. Knowledge of these relationships can be used to validate claims of distant kinship, establish relationship networks within groups of interest, or identify remains when close relatives are not available, such as cold cases, mass disasters, or casualties of past conflicts. Please fill out the form to receive a sample report. We will validate your information and reply back to you via email.